Our Product of the Month for December is the Twist Flexible Display System. Twist systems are an eye catching large format exhibition backdrop made up of individual banners that are not only portable but also offer the flexibility to grow with your business and display marketing needs. Twist banners are ideal for businesses of any size as they can be used as a singular banner or linked together with other twist banners to create a larger, modular exhibition stand using either the flexi-link kit or the easi-link kit. Twist systems are made up of singular banners that are available in a wide range of sizes including 700mm, 800mm, 900mm and 1000mm wide as well as 2000mm, 2250mm and 2700mm high. The banners are linked together using flexi link kits which enable the display to bend and flex without compromising the seamless graphics. As well as the various sizes available there are also different types of twist banner that can also be linked to one and other to create a flexible exhibition stand. 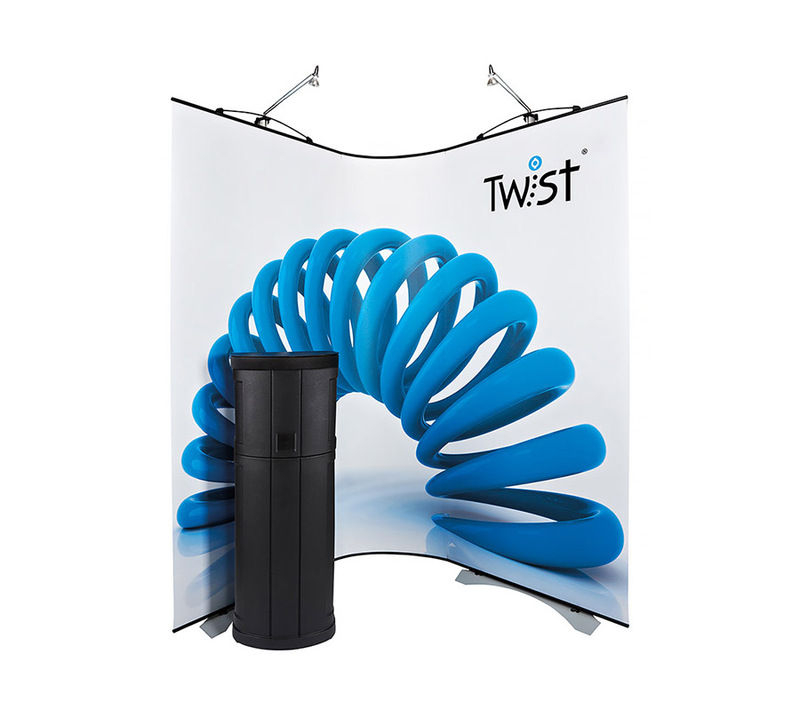 The Twist Original Banner Stand is the main component to creating a Twist exhibition stand. The Twist Original is a sleek and versatile banner which can either be used as a banner on its own or linked to other Twist banners to create a larger bespoke exhibition stand. The Twist Media Banner is similar to the Twist Original however it has the added benefit of being able to hold a monitor up to 7.5kg in weight. Audio Visual exhibition equipment is growing in demand and this allows you to showcase your business and what you have to offer through visual content. The Flexi-link Kit which is a 550mm wide graphic panel used to connect two Twist Banners together. The panel uses a spring loaded neoprene graphic rail which allows you to bend and flex the graphics. The rigid construction of the rail helps to maintain a seamless graphic throughout the stand. The Easi-link Kit is a simple linking kit which allows you to directly link two Twist Banners together as opposed to having a flexi-link panel in between the banners. This forms a rigid display and is ideal for covering back walls or large straight areas whilst maintaining the seamless graphic. Flexibility is one of the biggest reasons why the demand for the twist system is growing in the exhibition industry. No matter the size of your business from start-ups to international companies, there is a Twist system to suit your businesses marketing requirements. 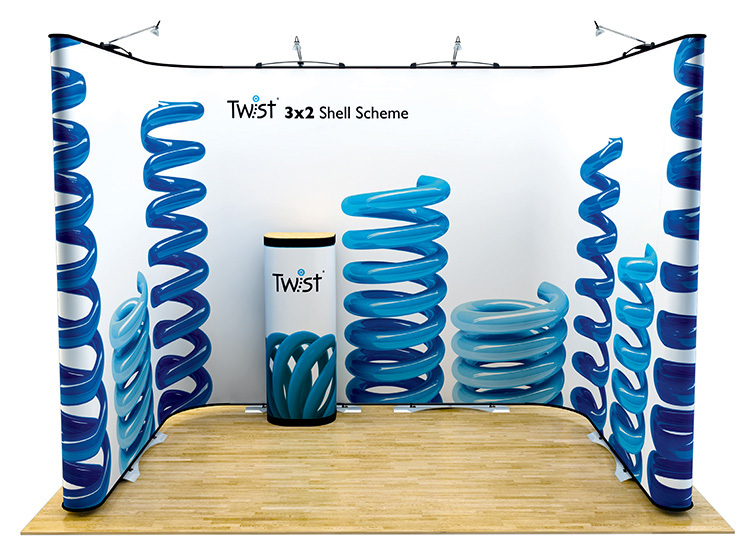 Due to being able to link Twist panels together this system has the unique ability to grow as your business grows and is ideal for first time exhibitors that are unsure of future exhibition stand size requirements. Twist systems of various heights, widths and styles are able to be linked together allowing you to configure eye-catching shapes and designs that will ensure your brand stands out. The ability to bend and flex your stand also means that it is easily adjustable to fit perfectly into the exhibition space you have available. Twist Banners include both a portable graphic bag and a padded hardware bag for easy transportation, however we do offer other cases to transport your Twist System such as the Wheeled Hardcase and the Wheeled Graphics Drum which are specifically designed to offer additional protection. Depending on the size of your exhibition stand the Twist system cases fit easily into the back of most cars and are even small enough to take on the Tube across London without hassle. The small size of the cases also allows for easy storage. Quality Assurance – We print and manufacture all of our banner stands in-house so we have complete control over the quality and finish of the product. We will only send out products that have been test-built and are quality assured. Price – We regularly review our pricing to ensure it is as competitive as possible, without compromising on quality. We offer a price promise and will match a competitor’s price on a genuine like-for-like product. Free Artwork Check – If you upload your own artwork one of our designers will ensure it is in the correct format for the best quality print. We will only print a graphic when we are 100% sure it will provide a high quality finish. No Artwork? Don’t Worry – We offer a design service and one of our Graphic Designers will work with you to create a design for your exhibition stand that is right for your business. High Quality Print & Materials – Your design will be digitally printed to photo quality standard onto stoplight media. Each graphic panel is then laminated to protect against tears, scratches and creases. Customer Service – As winners of Peterborough Business Awards 2015 Customer Service Award, we are proud of our high quality customer service. Be assured that we will help you though every step of your order.